Another week has passed by and we have seen some amazing bets being placed in last few days by out user Codie251! Not only this, but we have successfully reached 3,333,333,333 bets on dice, thanks to all our users support. With the month coming to an end already, the March wagering contest is also about to come to an end soon. 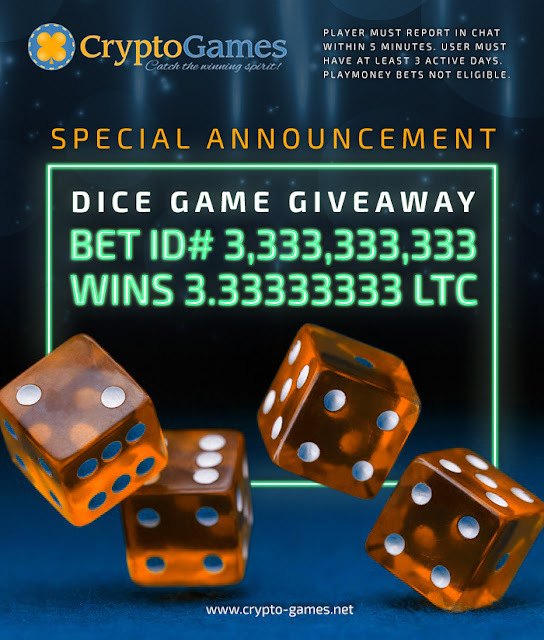 We have hosted another event where the person who is able to hit the 3,333,333,333 Dice bet id will get some sweet Litecoin as a reward. Our user DanCoin was able to hit the bet id and was rewarded with 3.33333333 LTC instantly. Congratulation DanCoin! Bitcoin: We have seen some huge changes on the bitcoin wagering contest leader board. User Codie251 has become to top player of bitcoin wagering contest for now. The user has wagered 338.2 BTC and will receive an estimate of 0.744 BTC out of the maximum reward of 1 BTC as a reward. If the user manages to add more wager to his total amount, the user might able to reap in the maximum reward. This has placed Sceobba658 to the second place who has wagered 333.444 BTC and will receive the maximum reward of 0.6 BTC. Third place has been captured by another new user Wulfwig831 who has wagered 76.46 BTC and will receive an estimate reward of 0.122 BTC out of the maximum of 0.3 BTC as a reward if the user manages to hold into his achievements. Bitcoincash: User Juan is still on the top of the bitcoin cash wagering contest leader board. The user has wagered a total of 233.03 BCH and will receive an estimate of 0.466 BCH out of the maximum reward of 6 BCH. This time Codie251 has popped into the second place within few days by wagering only 195.8 BCH and will receive an estimate reward of 0.352 BCH out of the maximum of 4 BCH reward. User m4asen is currently on the third place by wagering 139.01 BCH and will receive an estimate of 0.208 BCH out of the maximum of 2 BCH reward. Dash: User Skyelar is sitting on the top position by wagering 167.99 DASH. The user will receive an estimate of 0.335 DASH out of the maximum of 5 DASH reward if the user manages to hold his position. Skyelar is followed by Itibor who is currently on the second place by wagering 74.48 DASH and will receive an estimate of 0.134 DASH out of the maximum of 3 DASH reward. Third place is currently taken by rimakk who has wagered a total of 61.944 DASH for now and will receive an estimate of 0.092 DASH out of the maximum of 1.5 DASH. Dogecoin: Currently we can still see our user Juan on top of the wagering contest leader board for doge coin. The user has wagered for now 17,157,529 doge for occupying this position and will receive an estimate of 34,315 Doge coin out of the maximum of 300,000 Doge. Juan is followed by esmert who has wagered 16,428,652 Doge and will receive an estimate of 29,571 Doge out of the maximum of 170,000 Doge. Third place is taken by Oger469 who has wagered an estimate amount of 14,237,445 Doge and will receive an estimate reward of 21,356 Doge out of the maximum reward of 100,000 Doge. Ethereumclassic: Once again, we can see juan on the top of the ETC wagering contest. The user has wagered 30,202 ETC for reaching this position and if he user manages to hold the position, based on his wagered amount will receive an estimate amount of 60.4 ETC out of the maximum of 70 ETC reward. Second place is taken by NiMa who has wagered a total of 5,629 ETC and will receive an estimate of 10.13 ETC out of the maximum of 40 ETC reward. Skyelar on this wagering board can be seen on the third position. The user has wagered a total amount of 1,279 ETC and will receive an estimate of 1.91 ETC out of the maximum of 20 ETC reward. Ethereum: Our back to back winner, Aylmer555 can once again be seen of the Ethereum wagering contest lead board and on the top position. The user has wagered 3,122 ETH and will receive the maximum reward of 5 ETH if the user manages to hold his position. The second place has been taken by Jermane821 who has wagered 2,002 ETH and will receive an estimate amount of 3 ETH which is the maximum reward. D3ca is on the third position who has wagered 859.39 ETH and will receive an estimate reward of 1.37 ETH. If the user wagers a bit more, he might be able to take in the maximum reward of 1.5 ETH. Neogas: User PorRoo can be seen on the top of the Neogas wagering contest. The user has wagered 2,231 GAS and will receive an estimate of 4.46 GAS out of 100 GAS maximum reward. PorRoo is followed by Exxon who has wagered 1,696 GAS and currently holding the second place. The user will receive an estimate of 13.05 GAS as a reward out of the maximum of 60 GAS reward. Third place is currently taken by ESHManny who has wagered 1,130 GAS and will receive an estimate of 1.69 GAS out of the maximum of 30 GAS reward. Litecoin: User Roberto311 is on the first position of Litecoin wagering contest. The user has wagered 1,707 LTC and will receive an estimate of 3.41 LTC out of the maximum of 15 LTC reward. Jok354 is currently on the second place and has wagered 1,658 Litecoin. Based on his position and wagered amount the user will receive an estimate amount of 2.98 LTC out of the maximum of 10 LTC reward. Nish44 is on the fourth position and has wagered 830.957 LTC to reach that position. The user will receive an estimate amount of 1.24 LTC out of the maximum of 5 LTC reward. Peercoin: User Miamaus1986 is sitting on the top position of peer coin wagering contest leader board. The user has wagered 22,112 PPC and will receive an estimate of 44.225 PPC out of the maximum of 500 PPC reward. Juan is currently on the second place by wagering 21,581 PPC and will receive an estimate of 38.84 PPC out of the maximum of 300 PPC reward. Skyelar is on the third place by wagering 21,367 PPC and will receive an estimate of 32.05 PPC out of the maximum of 150 PPC if the user manages to hold on to the current position. Stratis: The first position of stratis wagering contest is currently being held by ESHManny who has wagered 9,128 START to get into this position. The user will receive an estimate of 18.25 STRAT out of the maximum of 400 STRAT. User grav is currently on the second position by wagering 8,182 STRAT and will receive an estimate of 14.72 STRAT out of the maximum of 250 STRAT. User Speers747 has wagered 4,465 STRAT which has placed him in the third position. The user will receive an estimate of 6.698 STRAT out of the maximum of 125 STAT as a reward. Monero: User Itibor has currently occupied the top position of Monero wagering contest of this month. To reach the position, the user has wagered 194.844 XMR and will receive an estimate of 0.389 out of the maximum of 8 XMR as a reward. Eega can be seen on the second place and has wagered 32.454 XMR. The user will receive an estimate of 0.058 XMR out of the maximum of 5 XMR as a reward. Third position is currently taken by kc1500 who has wagered an estimate of 30.92 XMR and will receive an estimate of 0.0463 XMR out of the maximum of 2.5 XMR. Less than 7 days left before the March wagering contest comes to an end. Don’t worry if you couldn’t join this month wagering contest. A new contest will start next month with new statistics. Don’t forget to join that one. More information about the current contest can be found by going to “Your Account” and clicking on “Contests”. Don’t forget, along with those free coins, you will also be getting free lotto tickets (for selected coins only) and the [VIP] tag with access to exclusive VIP chat channel. VIPs also have no dice speed limit every day! Almost 3 weeks have passed since the last jackpot has been hit by Shahista. This means we can expect to see a jackpot being hit anytime soon. So, head over to the casino and start hunting for the jackpot! Once again, we would like to remind you that the jackpot rules has been changed. More information on how to win the jackpot and claim 100% of the reward can be found at the “Jackpot” section in FAQ. If you still have questions about the jackpot, feel free to ask us on the chat channel. Bitcoin Lotto Round 355 has been won by Crypt0Knight (1st and 2nd place with a win chance of 6.224 %), Sojourner (2nd place with a win chance of 0.830 % only!). Each user won a total of 0.020485 BTC and 0.003615 BTC according to their respective position. Ethereum Lotto Round 147 has been won by Skyelar (1st place with a win chance of 49.254 %), Cent21 (with a win chance of 17.91 %) and santi77777 (3rd place with a win chance of 19.403 %). Each user has won 0.0804 ETH, 0.0151 ETH and 0.005 ETH according to their respective position. Litecoin Lotto Round 89 has been won by Skyelar (1st and 3rd place with a win chance of 23.469 %) and Armani123 (2nd place with a win chane of 2.210 %). Each user has won a total of 0.769 LTC and 0.136 LTC respectively. Doge Coin Lotto Round 177 has been won by Skyelar (Taking 1st, 2nd and 3rd position with a win chance of 36.863 %). The user won a total of 51,000 DOGE! Doge Coin Lotto Round 178 has been won by Afknow (1st place with a win chance of 24.138 %), fatgooseNNA (2nd place with a win chance of 6.897 %) and NobFox (3rd place with a win chance of 6.897 %). Each user won 4,640 Doge, 870 Doge and 290 Doge according to their respective position. User chris made a profit of 0.0243 BTC by wagering (Dice BetID: 3,305,595,661) only 0.00102 BTC and being able to hit a high multiplier of x24.75. User Ikbal1141786 made a profit of 0.0916 BTC by wagering (Dice BetID: 3,310,872,686) only 0.0611 BTC and being able to hit the x2.5 multiplier. User NiMa made a profit of 78.64 ETC by making a risky bet (Dice BetID: 3,320,451,275) of 78.64 ETC! User chris has made a profit of 0.0629 BTC by wagering (Dice BetID: 3,323,067,017) only 0.02 BTC and being able to hit the x4 multiplier. March wagering contest has less than 7 days before it comes to an end. Don’t worry if you missed this month’s wagering contest. You can join the April’s wagering contest. Don’t forget about the Monday’s which can be a huge advantage for users to reach the top of wagering contest leader board. Keep in mind, there are coins that are not much active in the wagering contest which you can join and easily reach the top position. If you have any suggestions or wish to leave a feedback, don’t hesitate to contact us through email or the directly through the chat!